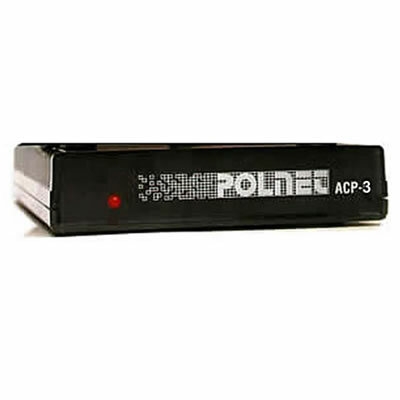 The Polnet ACP-3 is a three device industrial grade automatic call processor designed to eliminate dedicated phone lines by expanding the number of devices to three that you can connect to a single line. The Polnet ACP-3 automatically answers the line and determines where each call should be routed. "Data Polling" calls that produce the proper security access code (DTMF tones) get routed to the assigned modem or device for each code. The ACP-3 also detects CNG tones for automatic routing to fax equipment. If no tones are detected, the Polnet ACP routes calls to a phone or phone system. Use the Polnet ACP-3 with Any type of modem - regardless of speed, throughput or standard, and type of data terminal - credit card authorization machines, money order terminals, Underground Storage Tank monitoring systems, alarm/energy control systems, storage and monitor systems, and more! Why pay for dedicated data lines? Use the ACP-3 instead!